Today’s Wallpaper Wednesday reflects the weather. Well sort of. It reflects what we should be experiencing: days filled with glorious, sun-drenched heat, stunning foliage and pretty butterflies. So to help us remember what those days feel like, I’m sharing a gorgeous print called Flutterby by Julien McDonald at Graham and Brown. 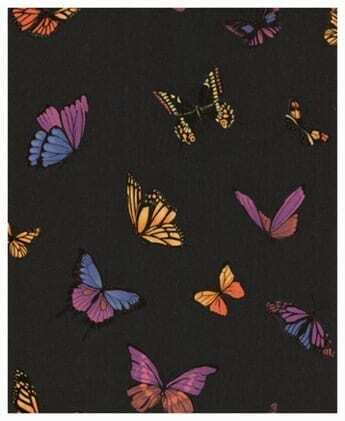 What drew me to this wallpaper is the dark, dramatic feel coupled with cool prettiness of the butterflies. I’m not one drawn to twee prints: to those tiny, speckled flowers all girly and innocent. I’m more into drama, statements and bold, brash images that shout ‘I’m here’ as you step through the door. This paper is somewhere in between I feel. It marries the drama with the sweetness of the insect extremely well, and so will appeal to a wide audience I’m sure. Where would you put it? A statement wall in your dining room, the downstairs loo (definitely one for impact) or the bedroom. Try the wall behind the bed, you don’t want to wake up to it necessarily but it will give you a focal point to decorate the rest of the room. Pick out the pinks for a more girly feel, or a pale blue as in the throw for a calmer, sophisticated look. Available from Graham and Brown for just £30 a roll. What do you think? 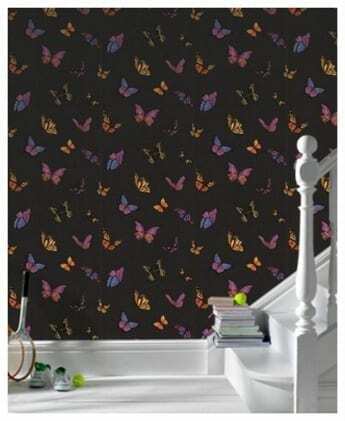 A must for all you butterfly enthusiasts and those who love a bit of dramatic wallpaper decor. I have a very similar print wallpaper behind my bed and you’re right it works excellently. I’m with you I’m not big on twee, love dramatic, plus a bedroom is a shared space, this print works really well for both me and my husband!